The annual event will be taking place on North Kansas Avenue and in Garfield Park! Get ready to enter the parade or egg hunt, have a booth at the fair, volunteer, be an entertainer or you can just come to enjoy and watch! Here’s a list of what’s going to be happening at this years Easterfest! Big Egg Hunt in Garfield Park in North Topeka! Family Fun Fair in Garfield Park in North Topeka! Food Trucks and food booths in and around Garfield Park! Vendor Market inside and outside Garfield Shelterhouse! Health & Fitness Fair inside Garfield Gym, with dance, gymnastics and other demonstrations! Live music at the Gazebo in Garfield Park, street performers and other entertainment! Bingo at the Vendor Market! Ball Toss – win one of 3 bicycles! Kid’s games & activities, crafts, pony rides, inflatables, petting zoo and more! We have thousands of attendee’s every year including churches, businesses and non-profit organizations which are in the parade. Many more set up vendor booths and kids’ games in the park to be apart of the family fun fair. The parade also consists of walking entries such as schools, military groups, marching bands, costumed characters, floats and more! This event is coordinated by C5Alive. 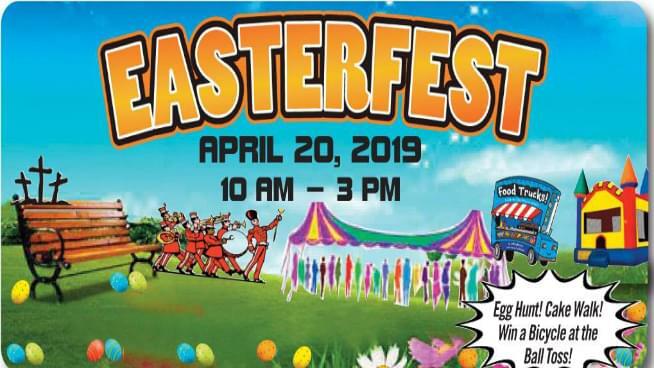 10:00 a.m.: Parade starts, beginning in NOTO Arts District and proceeding north on Kansas Ave. to Garfield Park, 1600 N. Quincy in North Topeka..
11:00 a.m.: Egg Hunt starts shortly after the parade in Garfield Park. 10:00 a.m. to 3:00 p.m.: Fun Fair will take place in Garfield Park, with activity booths, Food Trucks, Vendor Market, Health Fair, entertainment, kid’s games and more! 11:00 am – 3 pm: Entertainment in the Park; Health & Wellness demonstrations inside Garfield Gym and Bingo in Garfield shelterhouse at the Vendor Market! Family Fun Fair will be full of activities geared toward children and families. There is booths, exhibits, and other activities such as Easter crafts, children’s games, scavenger hunts, facepainting, photo booth, baked goods, Bubble Soccer, Laser Tag, pony rides, archery, bounce houses and more!Live performers will be there all day, including bands, dance troupes, fitness, martial arts, ballet & gymnastics demonstrations and more, performing inside Garfield Gym and outside in the Park. For more information, email info@C5Alive.org or call 785-640-6399. Information can also be found at the Topeka Easter Parade facebook page. Registration forms for parade entries and vendors are at www.TopekaEasterParade.com.